This a story about lost love, old songs and one of the oddest burial site in the Garden State. For the past 189 years, Mary Ellis has resided on what was once a stately piece of property overlooking the scenic Raritan River. Many things have changed since the young girl was laid to rest. According to legend, Mary Ellis’s younger sister Margaret was living in New Brunswick, NJ, around in the 1790s. Ellis came to visit her sibling and fell in love with a sea captain and former Revolutionary War officer. The captain sailed out to sea and vowed that when he returned he’d marry Mary. He even went so far as to leave her his beloved horse. Guess who never came back? The captain of Mary’s heart. Unfortunately, she never gave up on his return and promise of marriage. The rest of Mary’s story reads like an incredibly short and sad Nicholas Sparks novel. Every day after her captain’s departure, Mary would ride his horse from her sister’s house, on what is now Livingston Avenue, down to the banks of the river to eagerly await a glimpse of her lover’s returning ship. In 1813, she purchased a parcel of farmland overlooking the river from which she would maintain her daily vigil. Mary died there fourteen years later in 1828, still faithfully anticipating her captain’s return. 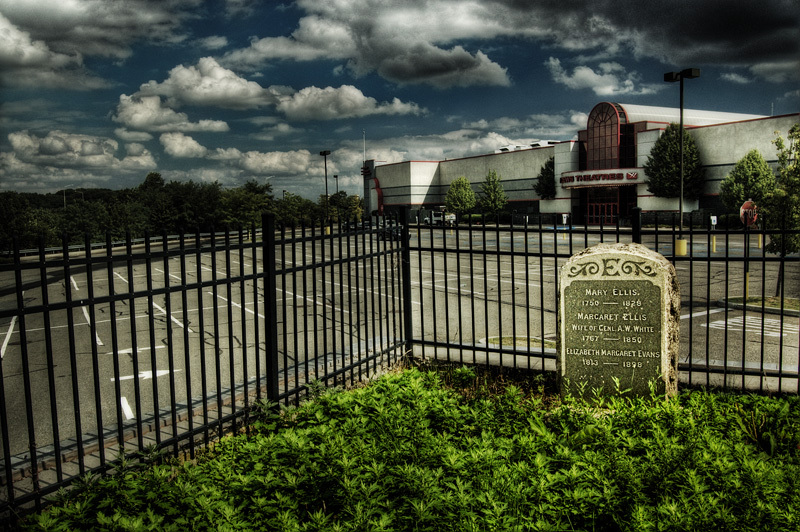 Mary Ellis was buried on the property along with her sister, other family members, and allegedly the captain’s horse. If Mary’s story sounds vaguely familiar and melodic, you’re probably familiar with the 1970s hit Brandy (You’re A Fine Girl) by The Looking Glass. In case your 8-track player is broke, here’s a performance of the classic soft rock tune. The rumor was that the band, formed at Rutgers University not far from Mary’s final resting place, wrote and recorded the song as an ode to Mary Ellis. The band has denied this over the years. Poor Mary can’t catch a break. The plot of land was bought and sold numerous times over the years but Mary’s grave always remained untouched. Her farm was paved and became a strip mall for a large portion of the 1980s-1990s until a developer bought the property and put up a Loew’s movie theater. The reason Mary’s gravestone and remains have stay in place is mostly out of respect, at least according to a former resident of the farm that once belonged to Mary and her clan. Hopefully, Mary rests in peace until the end of time. And the horse she rode in on.